As seen at all the best garden parties, family events, wedding and company fundays. These are giant versions of the classic games we have all played with over the years. They have been so popular since we introduced them to our range a few years ago and are enjoyed by both adults and children alike. 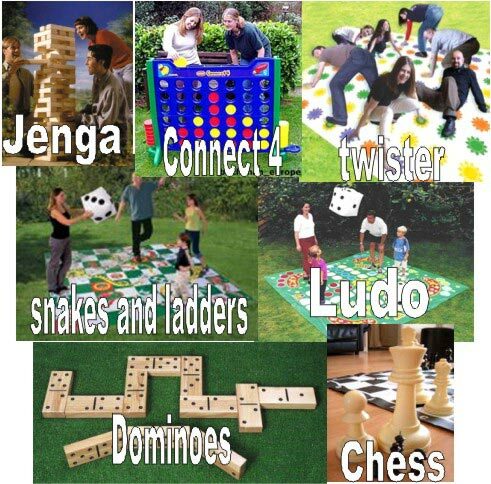 The giant games are suitable for teambuilding days and are also used for giant games evenings at pubs & social clubs. Remember to ask for our special package price - choose any 4 games! This has to be the most popular of all our games. The board is freestanding and about a metre square – it has proved popular at all kinds of events including youth clubs, teambuilding days, family fundays etc. Hire as many of these space hoppers as you need, set up a course for yourself, with obstacles and bounce! We provide gates, hoppers and jumps, along with a set of rules!!! A must for any 70’s themed party…. Big blocks of wood are towered up and the game begins…. Players take it turns to take a piece out of the tower and balance it on the top. The game is played until the tower crashes to the ground. A huge version of the original game. Instead of moving pieces around, players move around our big board climbing up the ladders and sliding down the snakes. The board game comes with a giant dice. Super-sized wooden pieces, perfect for playing on the grass in the sun. This giant twister type board game promises massive fun for up to 30 players. Throw the giant inflatable dice to find out which part of your body you have to twist onto a colour on the play mat. A great centrepiece at BBQ’s or Caribbean & Hawaiian parties, we have a professional limbo pole. Have a few drinks, limber yourself up, and get the party started with a limbo competition. Professional numbered sacks, recreate your school sports day.